BEIJING - China will step up efforts to improve people's livelihoods through holding down inflation, increasing affordable housing and raising farmers' incomes, Premier Wen Jiabao said on Monday. 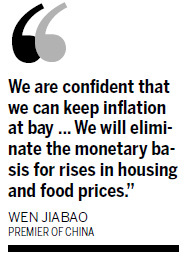 Inflation will top the government's agenda this year, Wen said. 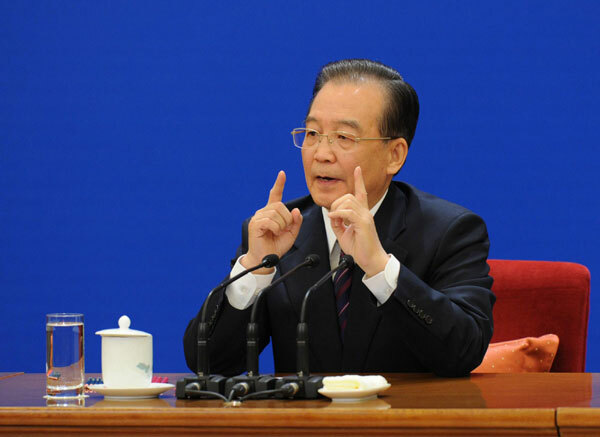 "Inflation is like a tiger; once it gets free, it is difficult to put it back in the cage," he said at the news conference at the closing of the annual National People's Congress session. The country faces both domestic and external challenges in fighting inflation, which reached 4.9 percent in February year-on-year. China has set a target of keeping inflation at or below 4 percent for the whole year. "International factors are behind China's inflation," Wen said, citing a "certain country's quantitative easing policy" that has led to drastic currency and commodity price fluctuations. The US Federal Reserve announced in November it would pump $600 billion into the US economy to bolster growth, which analysts said would in turn raise the risk of rising prices across the world as it leads to a weakening dollar and increasing liquidity. Oil prices, for example, have recently hovered at around $100 a barrel. "A severe difficulty is international food price inflation, which China cannot control," said John Ross, visiting professor at Antai College of Economics and Management, Shanghai Jiao Tong University. "This will continue even if excess liquidity is removed inside China," he said. Worse, some even forecast the US Fed may continue to inject capital into the market after June in a so-called third round of quantitative easing. Although he holds that the possibility is slim, Ross said if there is a third round of easing, it will make the situation more difficult for China, as it will increase international inflation. China will strengthen grain production and circulation to ensure food prices are stable, Wen said. 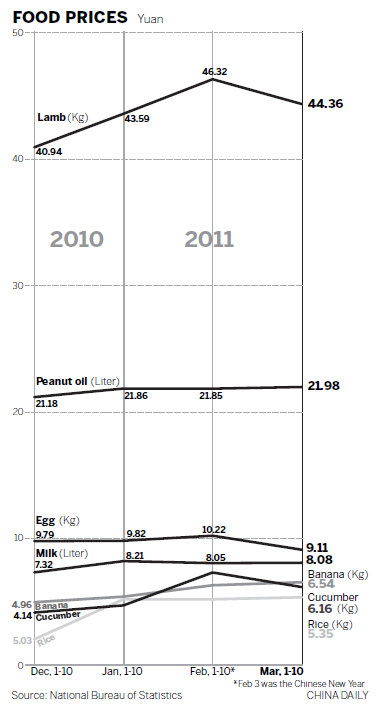 Increasing food prices account for about 30 percent of the country's inflation. Experts, however, are divided over how the price trend will evolve this year. HIS Global Insight, a consulting firm, said inflation is yet to peak in China. "The full impact of the oil price shock is yet to reveal itself as the government has been behind the curve in raising the retail gasoline prices," it said in a research note. Besides, bank lending remains rampant and liquidity is strong, it said. However, Ba Shusong, senior economist of the State Council's Development Research Center, said the peak may have passed, though inflation could remain high in the coming months since it is coming off a low base from last year. Whether or not the worst has passed, Wen said, "we are confident that we can keep inflation at bay." Wen also said the government will control liquidity to curb rises in housing prices. "We will eliminate the monetary basis for rises in housing and food prices." 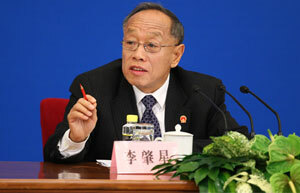 It will also provide more affordable housing for low-income earners, with 36 million units to be built by 2015, Wen said. Other measures to improve people's living standards include increases in the minimum purchase prices of grain from farmers, Wen said. "The minimum prices will continue to be raised significantly," he said. Farmers will also benefit from expanded access to job opportunities in cities. He said there are 242 million migrants from rural areas working in the cities. Those measures to improve people's living standards are important for the country's sustained growth, said Ross. "China's population must benefit from its economic development. Over the long run, popular support for such a policy, which improves China's quality of life, will allow China to maintain a high level of growth that will benefit the world economy," he told China Daily. Wen said China will continue to stick to the reform of the formation mechanism of the yuan exchange rate. "The appreciation of yuan must be gradual, because it affects jobs and raises pressure on enterprises and employment, and we must maintain the overall social stability," he said. Wen also recalled the difficult situation between the end of 2008 and the first half of 2009 when international trade plummeted and China's economic growth fell sharply. "It's with very hard efforts we managed to make the Chinese economy one of the first in the world to achieve a recovery and rebound, and avoid setbacks in China's economic development," he said.